On 25 October, Norway celebrated the anniversary of its liberation by the Soviets from German occupation in 1944. In commemoration of this important day, Norwegian Prime Minister Erna Solberg hosted Russian Foreign Minister Lavrov in Norway. Neither Belarusian nor Ukrainian officials were invited to attend, despite the substantial contributions of both these nations to the Soviet struggle against Nazi Germany. Unfortunately, letting Russia claim victory for itself during WWII at the expense of other post-Soviet countries has become a trend in the international community. Moscow monopolises the Soviet WWII narrative for propaganda purposes at home and abroad. Russia's monopoly on the victory is especially tragic for Belarus whose people overwhelmingly sided with the Allies and paid a much higher price for this historical victory over Nazi Germany than many other European nations. Moscow continues to drop hints of their moral superiority over the West as a result of the high price the Soviet Union paid for its victory over the Nazis. The Kremlin is also continuing to exploit the Soviet Union's collective victory during WWII in support of its current foreign policy objects. [u]nder Russian interpretation of history, the struggle that began with the German invasion of the Soviet Union in 1941 continues for Russia today, in a direct line through the generations, with the conflict in Ukraine. The Kremlin can be accused of many things, but modesty is not one of them. In 2010, Putin announced that Russia would have won the war with Nazi Germany even without Ukraine's assistance, "because we [Russians] are the victors," and "the war was won mostly thanks to the resources of the Russian Federation". Amazingly, Russia's attempts to monopolise the Soviets' victory has been met with very little resistance in the West. Earlier this year, the French government declined to invite Belarusian representatives to the 70th anniversary of the Allied forces landing in Normandy. Instead, out of 15 former Soviet republics, Paris invited only Russia's President Putin and President Poroshenko of Ukraine – the latter apparently primarily to carry out negotiations on the Ukraine crisis. 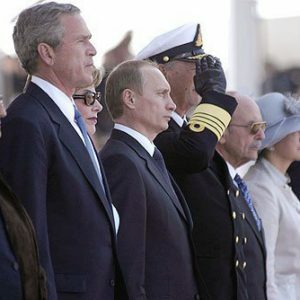 The previous 60th anniversary of the Normandy landing, which was commemorated back in 2004, also featured President Putin – and not a single other official representative from the ex-soviet states were in attendance. Even historical institutions are culpable in this historic justice – thus, the former Soviet military museum in Berlin became the German-Russian museum in the 1990s. Putin's have demonstrated a similar stance. In its article "Russians Rewrite History to Slur Ukraine Over War", Time magazine describes Moscow's exploitation of the conference on memory of the Nazi atrocities to promote its present day policies. Despite these insights, Time effectively appropriates the narrative that the Soviet victory was Russia's victory. The non-Russian populace from the Soviet Union, however, contributed at least as much as the Russians to the war, especially the Eastern Slavic nations of Belarus and Ukraine. The war waged primarily on Belarusian and Ukrainian lands and barely touched Russia proper. Many of the bloodiest episodes of the war – stagnate front lines, guerrilla warfare and counterinsurgency – also primarily took place in Belarus and Ukraine. They resulted in catastrophic losses. The counterinsurgency operations by Nazi forces in Belarus burned down either completely or partially 5,295 Belarusian villages and led to the death of 150,000 of their inhabitants. A recent article by Andrej Kotliarchuk in the Journal of Belarusian Studies shows that the total number of Belarusians who died in WWII is still a matter of debate. The estimated casualties among civilians inside Belarus vary between 750,000 and 1.4m. Together with Belarusians who died fighting Nazi Germany or died at the hands of the Nazis outside Belarus, the total figure of Belarusian casualties is estimated to be around two million people (out of a pre-war population of 10.5m), including many Belarusian Jews. Before 1939, Belarusians lived a life divided – some lived in Soviet Belarus, others in Western Belarus, which was at that time ruled by Poland. Yet throughout WWII Belarusians in the east and west sided with anti-Nazi forces. Ethnic Belarusian soldiers in the Polish Army bravely fought against the German invasion in 1939. Later on, ethnic Belarusians and Ukrainians constituted up to a third of the Anders' army, a Polish force, that was deployed to the Middle East and Italy. After the German invasion of the Soviet Union, the Belarusian population largely avoided collaboration with the Nazis. 1.3m ethnic Belarusians and natives of Belarus joined the Red Army, despite the large-scale political violence from years past in the Soviet Union. Others headed to the woods with gun in hand. Already by the end of 1941, 12,000 armed Soviet Belarusian partisans were actively at work in the nation's woods and swamps. By 1 April 1944, 185,000 armed fighters fought were in the ranks of the Belarusian Soviet partisan units that were subordinate to the Belarusian Staff of the Guerrilla Movement (BSGM). Ethnic Belarusians in the BSGM units made up over 65% of their fighters. In addition, a number of non-Belarusian guerrilla units operated in Belarus which were subordinate inter alia to the Central Intelligence Directorate of the Soviet General Staff (GRU). They stood out for their more skilled fighters – some of them even parachuted in from Moscow. But Belarusians fought in these units as well and among them were the creme of the Belarusian intellectual class, including famous Belarusian philologist Fyodar Yankouski who worked as an intelligence chief for a GRU partisan unit near Minsk. To understand the full scale of the partisan movement, one needs first to add to these figures the huge losses that the partisans suffered. Second, there were large Polish partisan units active in western Belarus as well. All in all, a very large number of Belarusians – of all ethnic backgrounds – actively participated in the anti-Nazi struggle, even under the most severe conditions of occupation. For the sake of comparison, in France (which in terms of population was about four times bigger than Belarus) 170,000 Frenchmen and women joined the armed resistance. The clearly substantial contribution of Belarusians as well as Ukrainians to the struggle against the Nazis and their allies was among one of the arguments for Soviet Belarus and Ukraine inclusion as founding members of the United Nations. Despite some claims to the contrary, collaboration with the Nazis remained very limited. The maximum number of armed pro-Nazi units was around 60,000 men. Many of them had been forcefully mobilised and easily deserted or joined the partisans. Is Lukashenka Worse Than Putin? Some media explained that Lukashenka's authoritarian dictator image that was to blame for an invitation not being extended to him to attend the Normandy landing anniversaries and other WWII-related events. These perceptions have resulted to a gross injustice being done to Belarus. These idealistic arguments about not inviting Belarusian officials on the grounds of their authoritarianism contradicts its own logic as both Putin and Lavrov of Russia have been invited to these and other ceremonies. The Kremlin knows how to exploit WWII ceremonies to support its propaganda through a well-funded domestic media and its careful targeting of a foreign audience with media outlets like Russia Today. The international acknowledgement of the Soviet Union's contribution to the victory over Nazis will not, in and of itself, lead to permitting Russia to monopolise this tragic, yet heroic, historic episode for its own purposes. The Soviet history of WWII also belongs to Belarusians and other former Soviet peoples who fought against the Nazis to win peace in Europe. Belarus ranks 53rd out of 187 countries in the 2014 Human Development Index (HDI). That places it ahead of fellow post-Soviet states Russia (57th), Kazakhstan (70th), and Ukraine (83rd). To measure development, HDI underscores the importance of “people and their capabilities” rather than economic metrics. It combines three dimensions of development: population health, access to knowledge, and the standard of living. Belarus scores extremely well on the knowledge dimension. However, it does far worse on population health and the standard of living, the other HDI components. It appears that Belarus boosted its HDI ranking largely by prolonging the time its population spends in school. Are Belarusians living long and healthy lives? HDI assesses population health by measuring life expectancy at birth. This component drags Belarus down in HDI rankings. Belarus’s life expectancy at birth has reached 72 years, which is five years lower than in neighbouring Poland and thirteen years below the HDI maximum value of 85 years. Premature death of Belarusian men constitutes the main problem. Men in Belarus live an average of 66.6 years, an entire decade shorter than women. The number has decreased since the 1980s and is now two years below the world average. About half of Belarusians who die prematurely have been smoking, drinking, or both. Do Belarusians enjoy a decent standard of living? The HDI standard of living component uses the logarithm of gross national income (GNI) per capita. The logarithmic transformation reflects the diminishing importance of income with increasing GNI. Belarus’s standard of living has improved throughout the 2000s. Between 1990 and 2013, GNI per capita increased by nearly 100%. In September 2001, an average Belarusian earned merely US$ 90 per month. By 2014, the average monthly income reached US$ 603. Belarusian IT specialists earn the highest wages (around US$1,500 per month). Despite Belarus's small size, regional income gaps persist. Minsk residents earn nearly 1.5 as much as the residents of Mahileu, the poorest part of Belarus. Even though Belarusians’ incomes have grown, they are lower than the incomes in Belarus’s Customs Union partners – Russia and Kazakhstan. Moscow remains a key destination for Belarusians searching for higher-paying jobs. How useful is education for Belarusians? Education is where Belarus excels. An average Belarusian attends school for eleven-and-a-half years. Belarusian children are expected to study for nearly sixteen years – only two years fewer than the maximum number of years allowed in the HDI education scale. Belarusians have the Soviet Union to thank for their current educational success. Unlike other colonial powers, the Soviet Union sought to eradicate illiteracy and made education free for all. In the Russian Empire, which since the 18th century incorporated two thirds of today’s Belarus, literacy rose from 56% in 1916 to 99% by the 1970s. All Soviet states provided eight years of compulsory education. All post-Soviet states have retained high enrolment in primary and secondary education to this day. The Soviet education legacy gives Belarus a leg up over many developing countries in Asia, Africa, and Latin America. Over half of the Belarusian population aged 25 and older has attained a tertiary education, which is greater than in all countries of Central and Eastern Europe except Russia, where nearly two thirds of the population have attained tertiary education. For comparison, only one fifth of Poles and less than a third of Lithuanians have tertiary degrees. Is such a high rate necessary? Belarusians with tertiary education make up 13% of the unemployed in Belarus, according to the World Bank. Indeed, in 2008 address to the nation President Lukashenka said that Belarus needs more “carpenters and joiners” than people with university degrees. The length of time spent on a school bench is not synonymous with the quality of education either. Gauging the performance of Belarus’s education system is impossible since Belarus does not participate in any international assessment programmes, such as PISA scales, TIMSS and PIRLS comparisons. If the results in other post-Soviet states are assumed to be representative, Belarus’s performance would average to poor. In 2014 the Belarusian State University ranked 763rd in the Webometrics Ranking of World Universities. While the Belarusian media framed the ranking as making the top 3% of all universities worldwide, the 763rd position is low when considering that many developing country universities rank higher, and that BSU is by far the best Belarusian school. According to the UNDP report, Belarus’s HDI of 0.786 exceeds the average of 0.735 for countries in the high human development group (there is also a very high development group). The report compares Belarus to Serbia and Azerbaijan, countries with similar population size and in the same geographic region. Belarus’ rank of 53 indeed compares favourably with these countries’ respective rankings of 78 and 76. The data clearly shows that Belarus outperformed all other post-Soviet states. But should Belarus set the bar so low? Were Belarus to look to its democratic neighbours to the west, a very different picture would emerge. In 1991, Belarus and Poland had equal life expectancies. Today Poles live five years longer on average. In 1991, GNI per capita in Belarus was $2,000 less than in Poland. Today the income gap is nearly three times greater. Ironically, Belarusians flock to shop in Poland because many goods and products (excluding cigarettes and alcohol) cost less across the border. Belarus has beaten Poland only in the expected years of education – Belarusians entering school today will be studying a few months longer than Poles. Of course, the quality of their education may not be any higher than that in Poland, since Belarus does not participate in any international education quality assessments. While Belarusian sausage may contain no toilet paper, Belarus still has a long way to go in terms of improving the lives of its people. And yet, because of the weights used in the HDI calculation, a country with maximum GNI per capita and life expectancy would rank lower than Belarus if its population were uneducated. Because of the mathematics behind HDI calculation, a country with the highest GNI per capita and the longest life expectancy in the world would get a maximum score of 0.666 – or much lower than Belarus’s 0.786 HDI – if its population were uneducated. 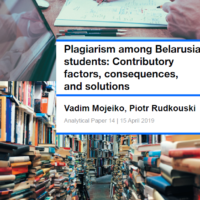 A more lasting solution for Belarus is to improve public health, reform the economy, and not least, equip students with the skills they need to succeed in the workforce, rather than just a degree.